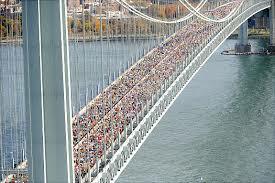 There is even more on the line than usual at this year’s ING New York City Marathon. From the city and New York Road Runner’s recovery efforts after last year devastation and race cancellation due to Hurricane Sandy, to the million-dollar payoff in the World Marathon Majors championship, there are stories of striving and overcoming that will make for a dramatic and emotional Sunday morning November 3rd. Be sure to watch it live 9 a.m.-12:30 p.m. ET on ESPN2, and from 9 a.m.-2 p.m. ET on WABC. It also will be streamed online at WatchESPN.com and the WatchESPN app. A two-hour highlights show will air on ABC later in the day. My focus will be on the men’s race as I will call that competition from the lead TV moto. It’s the first time since 2006 that I will be out on the course rather than at the finish line anchor location. And though I will sorely miss calling what promises to be a compelling women’s race, the men’s lead moto is a wondrous perch, and offers by far the best view of the action. Chicago, Illinois – As I commented on the final miles of the 2012 Bank of America Chicago Marathon from my vantage point aboard the lead NBC5 TV motorcycle, I was reminded again what the sport of distance running lost with the tragic passing of 2008 Olympic champion Sammy Wanjiru in the spring of 2011. Why? Because yesterday’s 35th edition of Chicago eerily resembled the 33rd running when the final two miles turned into what many believe was the most compelling marathon duel in the sport’s modern history. During that epic run I was again sitting just a meter or two away trying to put words to the numinous. 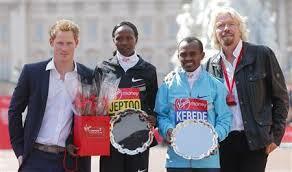 Like yesterday, Ethiopia’s Tsegay Kebede took control of the race after the final pacer bid adieu at 30K. 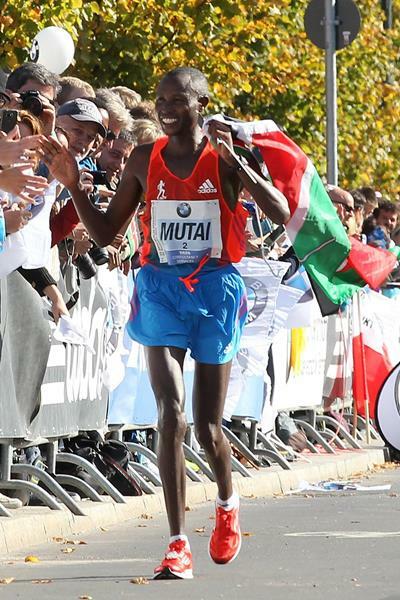 Then, in those majestic final miles he did everything he could to break free from the indefatigable Kenyan Wanjiru. On the back of at least three separate surges Kebede developed what seemed a winning margin, only to have Wanjiru resurrect like a bad relationship, before Sammy turned aggressor and buried Kebede for good in the final 600 meters. Similar to Salazar and Beardsley in Boston 1982, and Khannouchi, Tergat and Gebrselassie in London 2002, the monumental drama had even veteran observers gnashing their teeth and punching nearby shoulders, so caught up were they in the unfolding spectacle between the two tiny east Africans. Yesterday, Kebede was again starring in the role of late-race protagonist, along with the often forgotten third man in that 2010 war, countryman Feyisa Lelisa who had hung on till 24 miles two years ago as a 20 year-old. Over the years Kebede and Lilesa have proven themselves as two of Ethiopia’s most stalwart marathon racers, both holding bronze medals, Kebede from the 2008 Beijing Olympics, Lelisa from the 2011 Daegu World Championships. Despite those credentials, both were snubbed by the Ethiopian Federation for the London Olympic team. Chicago would be their chance at redemption. What Korir just described is the Alpha Effect, the psychological control a single athlete has on his competitors by nothing more than his very presence. The power an Alpha has over other runners can corrupt even their best moves before they have been played out. Last year in Chicago Kenya’s Moses Mosop, arriving as the 2:03:06 Boston Marathon runner up and world record holder at 30K on the track, was the Alpha male. We’ve seen them through the years, men like Toshihiko Seko, Rob de Castella, Paul Tergat and Haile Gebrselassie, the athletes who everyone else has their eye on, waiting to see what he does, controlling the race no matter where he may be in the pack.